Santa Coloma de Cervelló used to be a small town dedicated to agriculture located close to Barcelona until its small territorial area, population density and financial solvency were all optimised thanks to the foundation of an industrial estate within its borders. It is the most magnificent and best preserved industrial estate in Catalonia and has been listed as a cultural heritage site. 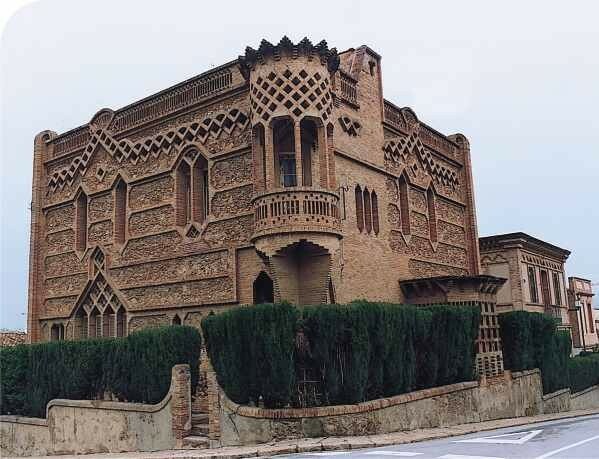 In 1890, Eusebi Güell i Bacigalupi moved the Vapor Vell textile factory from Sants to a building that his father, Joan Güell i Ferrer, had acquired in Santa Coloma de Cervelló. It was there that he wanted to develop the innovative idea of a Garden City, which was inspired by his contacts with England. A place in which life and work were united in highly satisfactory conditions, in terms of both the quality of life for workers and work production and performance. In exchange for greater personal and work involvement with the estate's owner, workers would have the comfort and well-being that they lacked in the capital, Barcelona. 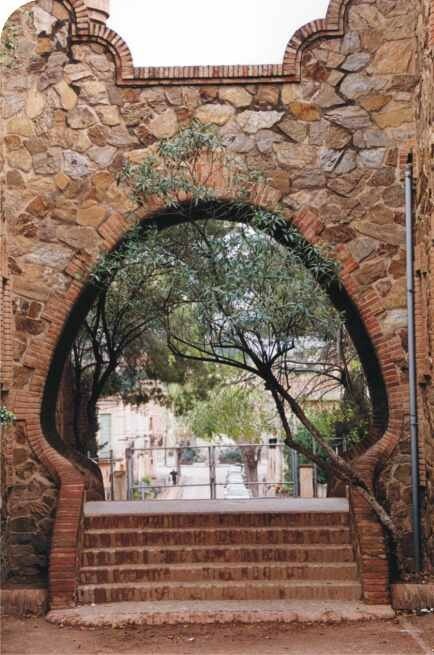 In order to do this, Güell combined services with aesthetic modernity. The Colònia Güell industrial estate was designed in the form of an L. The buildings that Eusebi Güell gave more relevance to are the highlights of its ordered and geometric design, such as the church and the school, because the pillars of the town had to comprise Christian morality and a healthy civic education. Güell brought together a wonderful group of Barcelona architects with whom he had already worked or knew and these men designed the estate's most outstanding buildings in terms of size as well as aesthetic qualities: Ca l'Espinal, by J. Rubió i Bellver; Escola del Mestre and Casa del Mestre, by F. Berenguer, and Ca Ordal, by the two aforementioned architects working as a team. These buildings set the stylistic tone for the town, opting for a surprising handling of brick and stone. The houses tend towards a play of shapes and forms, a functionalism of their elements and a hybrid aesthetic that combined the telluric (stone), historicism (neo-Medieval and neo-Arabic) and, most importantly, an attempt to create or invent a new, more striking architecture. This same spirit, although more sober and less ornate, can also be seen in the houses for workers, in which master builders like Andreu Espinal and Agustí Arimany participated. 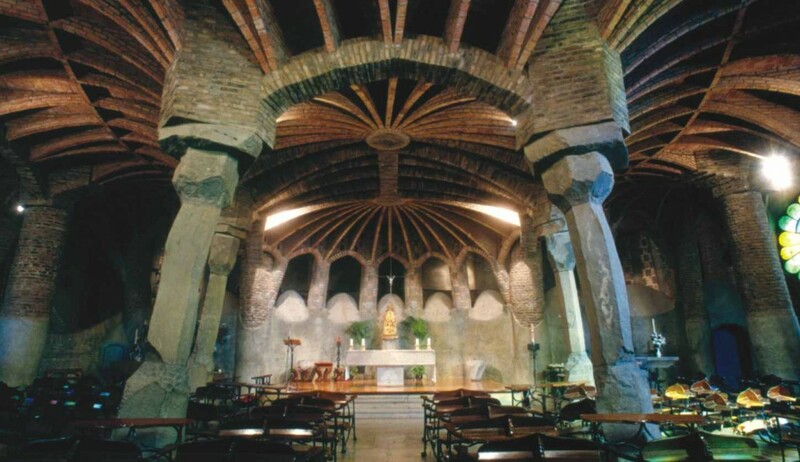 The Colònia Güell belonged to the field of free experimentation and the blind faith of a promoter who trusted his architects, culminating in the church for the Colònia, popularly known as the "crypt". 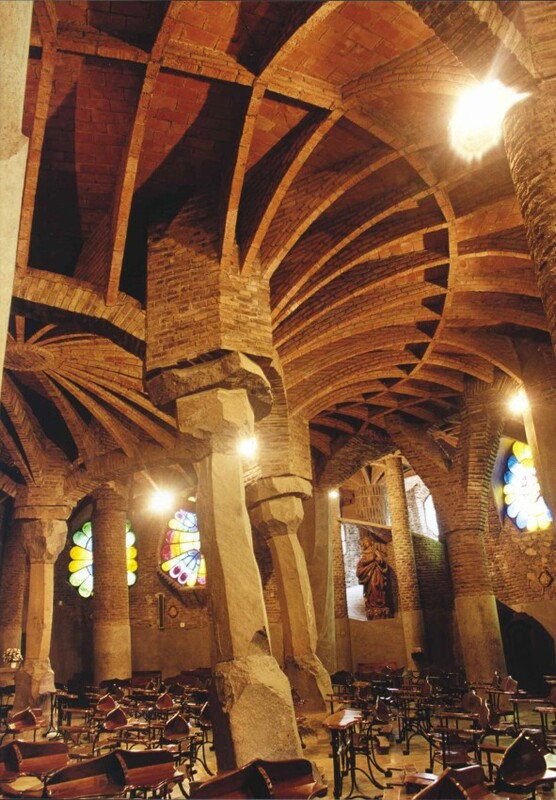 It was designed by Gaudí, who used it as a testing ground for the Sagrada Família, and his concerns for a new architecture based on structure, spatial experience and the application of handicrafts are all brought together here. It is a terrific work that was far ahead of its time in terms of the styles of the era.